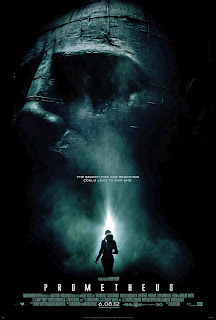 There are two movies locked in a stubborn struggle for supremacy in Ridley Scott’s muddled Prometheus, a sorta, kinda prequel to his landmark 1979 classic Alien. On one hand, we have a through-and-through science-fiction horror exercise that, akin to its predecessor, chronicles what happens when a group of unprepared, short-sighted humans step foot on a mysterious planet that couldn’t be any less accommodating. On the flip side, though, the picture also wants to be an ambitious mind-tripping examination of dense philosophical quandaries relating to man, God, consciousness and creation, complemented by breathtaking, impeccable cosmic imagery that evokes the work of heady helmers Stanley Kubrick and Terrence Malick. Alas, while there are pleasures to be found in both disparate halves, the whole is drained of potency and coherence, leaving behind an astonishing, messy curiosity that tantalizes the senses and aggravates the brain. Set in the year 2093, the film places us alongside a team of researchers aboard the deep space research vessel Prometheus – named after the mythological Greek Titan who moulded man from clay and gave him fire – seeking to solve the riddle of mankind’s origins. Drawn to the rocky, barren moon of LV-223 by ancient cave paintings, the eccentric group – which includes archaeologist couple Elizabeth Shaw (Noomi Rapace) and Charlie Holloway (Logan Marshall-Green), sardonic Captain Janek (Idris Elba), tough-as-nails mission director Meredith Vickers (Charlize Theron) and obedient android David (Michael Fassbender, continuing his career hot streak) – investigates a great dome-like cave decorated with mysterious canisters, Olmec-ish statues, tell-tale wall carvings and, most crucially, immense decayed corpses. These bodies belong to a race of tall, muscular, bald aliens – resembling refuges from a Tool video – who, in the movie’s intriguing and somewhat ambiguous opening scene, we see kick-starting life on Earth (?) through a bizarre, hideous ritual. What further secrets do these beings hold? And what is contained within those countless metal containers littering the ground? 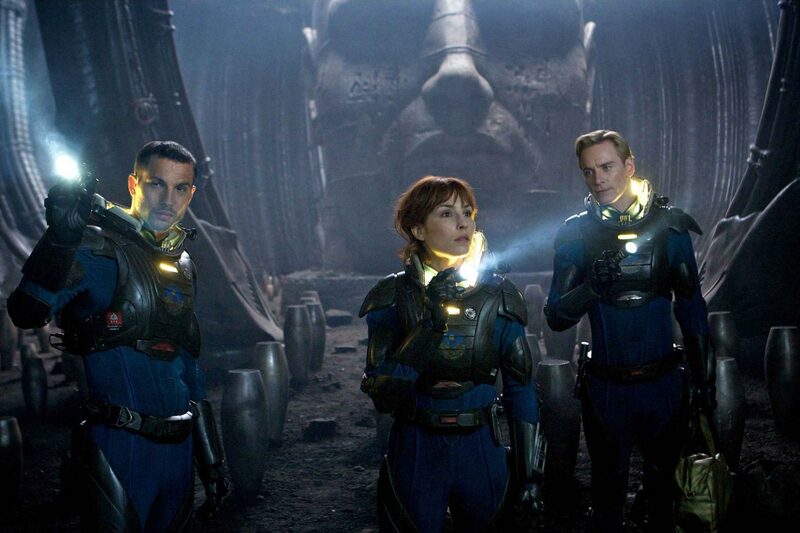 Prequels are always a shaky prospect – there’s not a whole lot of drama involved in the business of setting up a well-known pay-off – and Prometheus doesn’t feel confident in where it wants to go. This isn’t an overt prequel ala Star Wars or last year’s The Thing; it appropriates familiar iconography and concepts, yet it isn’t a monster-driven movie, or interested in leading seamlessly into the 1979 picture. Rather, it wants to expand the series’ cinematic universe and tackle decidedly non-Xenomorph ideas, which is a mite strange given the beautifully simple, and thematically rich, modus operandi of the preceding entries (One wonders why the filmmakers didn’t just create an original work). Unfortunately, the undercooked results are more frustrating than rewarding, a two-headed beast that isn’t satisfying enough as a think-piece or as an Alien installment. For hard, philosophical sci-fi to work, questions don’t have to be answered, however they should be explored. The script, originally by John Spaihts and reworked by Lost co-creator Damon Lindelof, is a hodge-podge of unformed ideas and barely expressed questions. Instead of delving into the mysteries posed by the subject matter, characters throw around buzzwords like “Engineer,” “maker” and “creation” without ever grappling with the consequences of their findings. Take Rapace’s Shaw, a crucifix-wearing woman of faith. She has helped uncover a potential truth that stands to contradict her deepest spiritual beliefs. How does she feel about playing a part in this discovery? How will she adjust to this unsettling reality? Does she feel alone? Frightened? Tormented? The script doesn’t care. Prometheus is content to raise the notion, but too timid to dig in. At one point the character of David, in response to being told he was created for no other reason than because it was possible, ponders how humans would feel if the same answer was given to them. But this ominous implication just hangs there, another fascinating, under-developed suggestion left flapping in a breeze of superficiality, never to lead anywhere truly provocative (*Sigh* Maybe in the sequel?). It would be easier to tolerate the film’s gussied-up shallowness if the genre story wasn’t such a shambles. Prometheus is fraught with maddening plot holes, dubious science, inconsistent or downright moronic behaviour (Don’t EVER pet the wildlife!) and third act reveals that earn more huhs than wows. Theron’s character’s surprise plot function is a real clunker, and the appearance of a certain talented actor buried alive in a mobile sarcophagus of rubbery make-up proves unnecessary and goes nowhere fast. 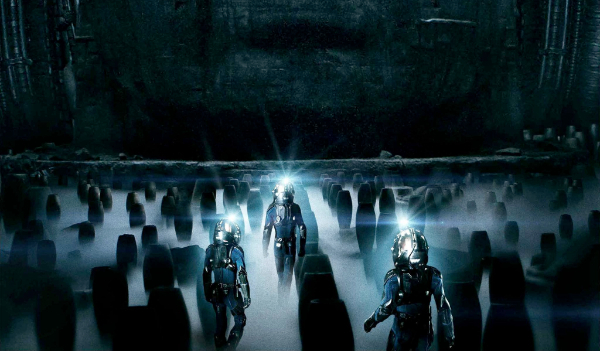 Even though the picture follows the rough structure of Alien, the sheer number of characters and sub-stories prevents the film from building up consistent energy. Unlike the crew of the Nostromo, where everyone was more or less working on the same page, the small army of scientists, crewman and corporate babysitters aboard Prometheus never coalesce into a compelling unit. 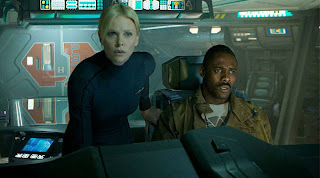 Personality is in short supply (although Elba and Theron hold up their ends), and the dialogue rarely rises above the mechanical. And when things do go haywire, there’s no one as charismatic as Sigourney Weaver to latch onto. Fassbender’s David, modelled on Peter O’Toole’s Lawrence of Arabia protagonist, is the film’s most fascinating and dynamic presence – and in perfect keeping with great past series androids Ian Holm and Lance Henriksen (Winona Ryder, not so much) – except his motivations and actions are left irritatingly murky; a wonderful concept swallowed alive by the film’s confused b-movie plot. While the framework may be shaky, it seems no one bothered to inform Ridley Scott, who tackles this film – his first sci-fi epic since 1982’s Blade Runner – with the visionary fervor of a young auteur with something to prove. Whereas George Lucas famously brought a sense of homey domestication to his galaxy far, far away, Scott takes his sweeping, ominous universe a step further, into the chilly mundane. This world, with its busy, utilitarian space ships and blackened, ropy-walled caves, feels lived in, tactile and, well, noticeably uncomfortable. As bizarre and captivating as this future looks to us, to these characters its old-hat, and the director effectively portrays their bored working class indifference. 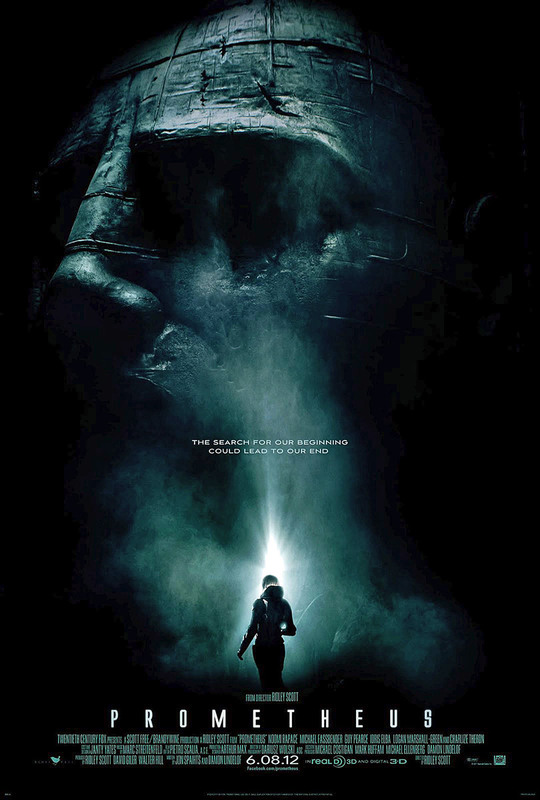 As a 3D experience cloaked in mood and atmosphere, Prometheus is pure spectacle, another gorgeous cinematic translation of H.R. Giger’s fetishistic designs and slimy, alarming genitalia-inspired terrors that don’t even know how to let go. The helmer can certainly still crank up the tension when needed too, as proven by one unforgettable scene involving a medical procedure no poor soul should ever be forced to endure. It’s this energized Scott who hauls Prometheus back from its abyss of mediocrity, imbuing it with enough grim, grand ‘n gruesome artistic craziness to warrant making the trip out to the biggest screen possible. Although this movie may be a disappointment, it’s also a provocative springboard for conversation, analysis and speculation for those who see it. You may depart the theatre with different questions in mind than the filmmakers intended, but there’s still merit in its ability to inspire wonder through pure sensation. It makes you wonder what Prometheus might have achieved with a script that didn’t become hopelessly and irredeemably lost in space.